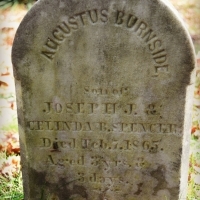 According to Audrey Mae’s artistic map and her gravestone numbering system in her Spencer Family Cemetery, Augustus Burnside’s gravestone is Gravestone Number Twenty-four. Using a Smith-Corona typewriter in the 1980s, Audrey Mae typed the following mini-biography of Augustus Burnside, a seventh-generation Spencer in East Greenwich, Rhode Island. 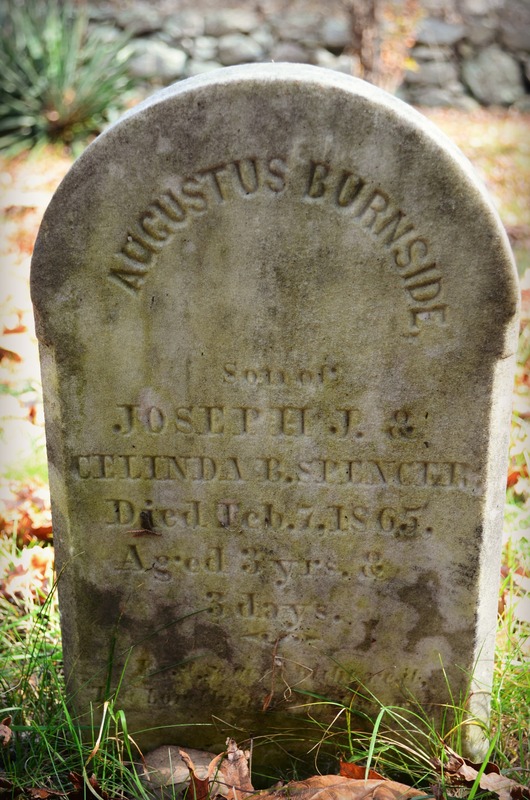 Augustus Burnside Spencer is the son of Joseph Jason (gravestone No. 9 and Celinda (née Kettelle) Spencer. He died as a young child of three years so his parents named their next child Richard Burnside (gravestone No. 14) Spencer (born 1866) with the same middle name. Augustus Burnside (No. 24) is the fifth child born of Jason Joseph and Celinda’s six children who are buried in the Spencer Family Cemetery. Burnside is not a Spencer name in Spencer genealogy so web author suggests “Burnside” may be a Kettelle name. More research is needed. According to Audrey Mae, Augustus Burnside’s father is Joseph Jason (No. 9) who is the fifth child of Richard Anthony (“Deacon”) (No. 6) and Roby (née Tarbox) (No. 5) Spencer. Augustus Burnside’s mother is Celinda (née Kettelle) Spencer who is Violette Kettelle’s great aunt. Celinda Kettelle, Augustus Burnside’s mother, was a great-aunt to Violet Kettelle who was a cousin of Audrey Mae, Edith Anna and John Edward. Violet and Audrey Mae stayed good friends all their lives and Violet meant a great deal to Audrey; Audrey died in 2007 and Violet died in 2004. They were both born in 1912. Violet Kettelle (2-22-1912–6-4-2004) was a Spencer historian who carried on the work of Esther Amanda (née Spencer) Briggs (1-21-1835–6-2-1929). Esther Amanda (“Aunt Mandy”) was the first Spencer historian known to descendants. Cousin Violet, as Audrey Mae called her, was the first woman to enter Penbroke College in Rhode Island. Violet taught school in Vermont for most of her long career. (glossary of audreymaespencer.com). On retirement, Violet returned to her family home on north side of Middle Road in East Greenwich, R.I., to the east of the Spencer family cemetery. Violette spent her retirement years at her family home on Middle Road and Audrey Mae (3-19-1912–3-11-2007) would often visit Violet on the Kettelle farm. Audrey Mae wanted all her daughters to know cousin Violet who was also a woman before her time. Violet had said that she could no longer visit her own family historical cemetery as the brush had grown up and concealed the graveyard, and it was too difficult or impossible for her to any more find it, never mind visit it. This entry was posted in All Gravestones, Born into the Spencer line, on December 15, 2012 by Heather.